Saigon used to be famous for its lush street vegetation and abundant greenery. Visitors during French colonial times would comment on the towering tropical trees that graced the city’s parks, the shaded boulevards that fanned out from the banks of the Saigon River, and the rich and varied botanical gardens. Now days, Saigon is known for its concrete and air pollution: a thriving and dynamic city it may be, but a green one it’s not. Or is it? There are still a great many parks and open spaces in this city, many of which date from French colonial times, and some of which have been born out of the city’s recent economic boom. 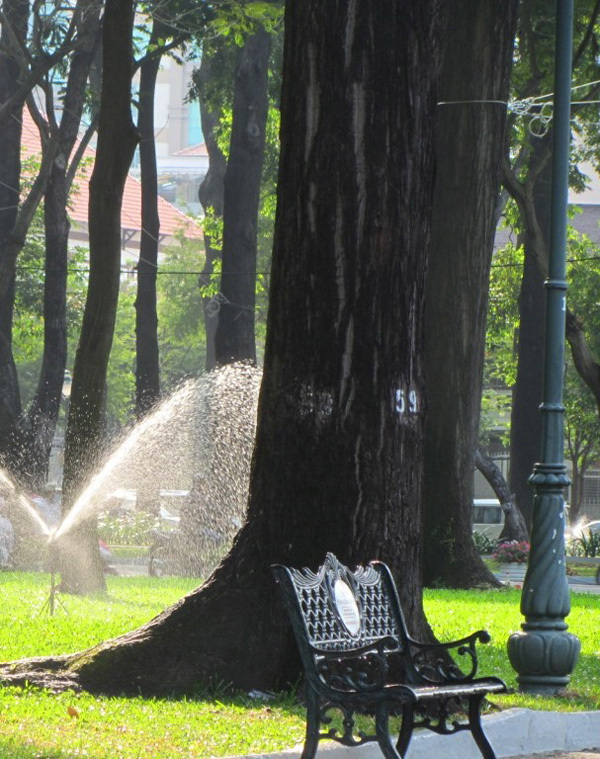 With the sweltering months of April and May upon us, I wanted to find out what kind of respite Saigon’s green spaces could offer. As always, the city didn’t let me down. The following parks and open spaces are scattered around the city. Unless otherwise stated, they’re all open from dawn till dusk and they’re all free. 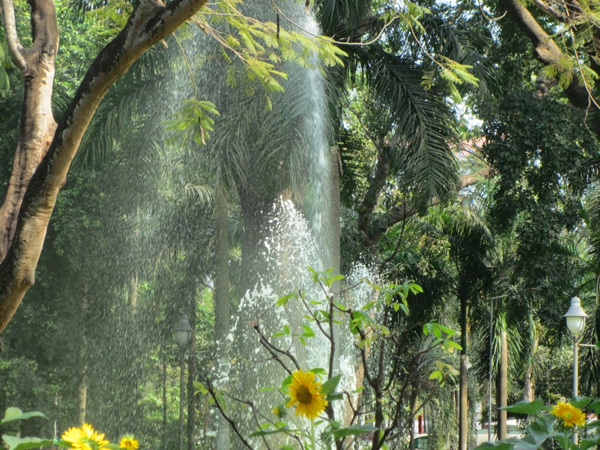 There are many more parks in Saigon than you might think, and they are all great places to escape the heat, noise, and pace of the city. Apart from peace and quiet, these parks offer opportunities to let off some steam: dancing, jogging, hula-hooping, tai chi, badminton, fishing, swimming and much more. Dripping with tropical foliage, these green spaces are a reminder that Vietnam is still one of the most biodiverse places on the planet; where everything and anything can grow, even in the middle of Saigon. All of these parks are best visited in the early mornings and evenings, when locals partake in myriad exercises, temperatures are relatively cool, and the aroma of grilled pork and coffee fills the air. Hoang Van Thu Park, SaigonFilling the triangle formed by the intersection of three of the busiest thoroughfares in the city, Hoàng Văn Thụ Park is an oasis of calm, cool, and quiet in the midst of a tide of traffic and a cloud of exhaust. One of my favourite and most unexpected parks in this list, it underwent renovation a few years back, and they’ve done a marvellous job. The beautifully maintained gardens are bursting with bright foliage, humming with birdsong – there are even squirrels in the trees – and filled with the smells of damp earth and flowers. Straddling either side of Phan Đình Giót Street, the lush grounds are big and well-kept, but not so manicured and neat that they become rigid and ornamental. A great variety of flora is on display here: screw pines, traveller’s palms, coral trees, casuarinas, tamarind, sago palms, copperpods, bamboo, heliconia, African mahogany, and bougainvillea to name but a few. The pathways are cool and the dense canopy muffles the sound of the surrounding traffic, turning it into a monotonous and almost soothing murmur; a lulling background noise. Huts and gazebos, covered in creepers and epiphytes, dot the park, under which people read, study, and make out. There’s very little of the kitsch ornamentation which blights so many other Saigon parks. Several small mounds of earth provide some height, and there’s a lake which you’re allowed to fish in, but it could do with a clean and some more water. Cool at any time of the day, this is definitely a place to while away some hours with a good book. I love it. Thu Thiem Tunnel Park, SaigonA fabulous new open space for Saigon, the small park above the east entrance to the Thủ Thiêm Tunnel, in District 2, offers superb views back over the river to the high-rises and colonial hotels of District 1, especially at night. Destined to become like The Bund riverfront walkway in Shanghai, one day the promenade park will extend along the length of the riverbank here. When the tunnel opened in 2011 and people first started to gather above the tunnel entrance at dusk, the police didn’t like it much. However, now that there’s a parking space, trash cans, and public toilets, local authorities seem to leave the groups of picnickers, lovers, and families alone, as they bask in the cool air and river breezes, taking in the views. 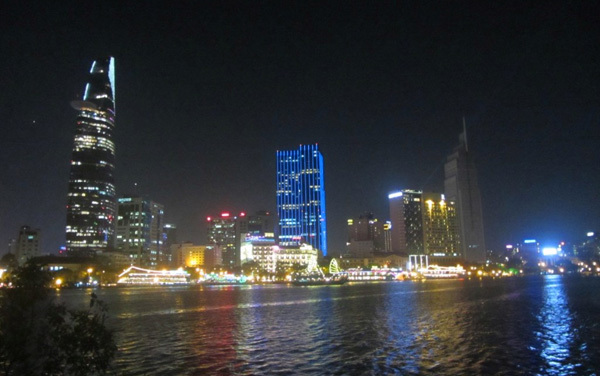 The large, paved square by the river is an excellent place to lay down a blanket, take out some sandwiches, and watch the lights flickering across the Saigon skyline. Boats ply back and forth along the black river, behind them the old and new icons of Saigon: the Majestic Hotel, the Bitexco Financial Tower, Nhà Rồng Warf. Young couples embrace on their motorbikes under gigantic advertising billboards on the riverbank, street vendors sell candy floss and ice cream to excited children, and teenagers engage in gossip and games between mouthfuls of food and drink. Great atmosphere; great views. Tao Dan Park, SaigonCompeting for the title of most impressive canopy of tropical trees in Saigon, Tao Đàn Park is a vast space in the city centre; the green lungs between the exhaust-stained arteries of downtown. Towering, century-old, African mahogany trees cast a welcome shadow over this park. Their columned trunks rise a hundred feet before exploding in foliage, filtering the heat, noise, and pollution of the city. Far beneath this leafy umbrella, hundreds of locals shake the lethargy of dawn from their bones by joining in communal dance classes, shadow boxing with friends, hula-hooping on the pathways, or swinging like a pendulum on the exercise apparatus. 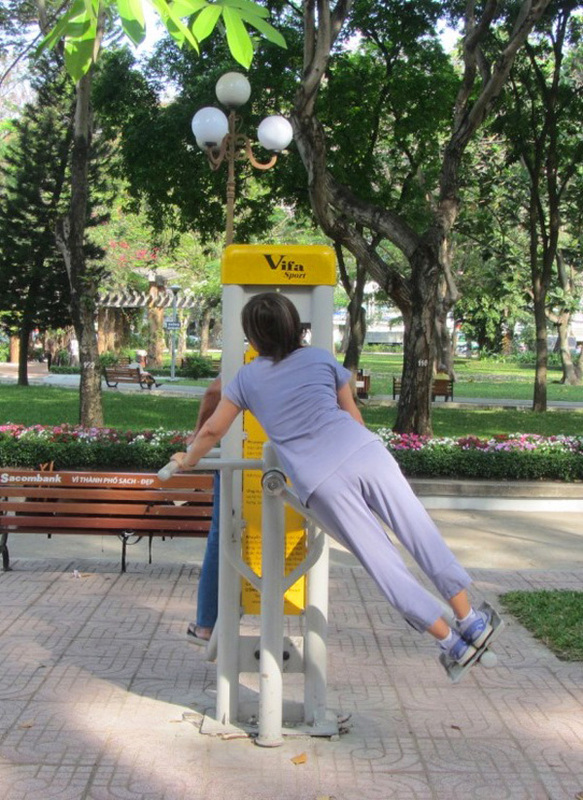 Unlike the rest of Vietnam, the average age here in the mornings is upwards of 50 years old: early morning exertion in the open air is a tradition which seems unlikely to pass down to the younger generation. Tao Đàn Park also displays some arts and culture: There’s an interesting sculpture garden to the east, a miniature re-creation of a red brick Cham temple at the centre, and a shrine to the Hung Kings, legendary founding royal dynasty of the nation. Crescent Walk, SaigonNew Saigon’s ultra-modern showpiece, The Crescent Walk is a traffic-free, paved promenade along the arcing bank of one of the city’s many waterways. 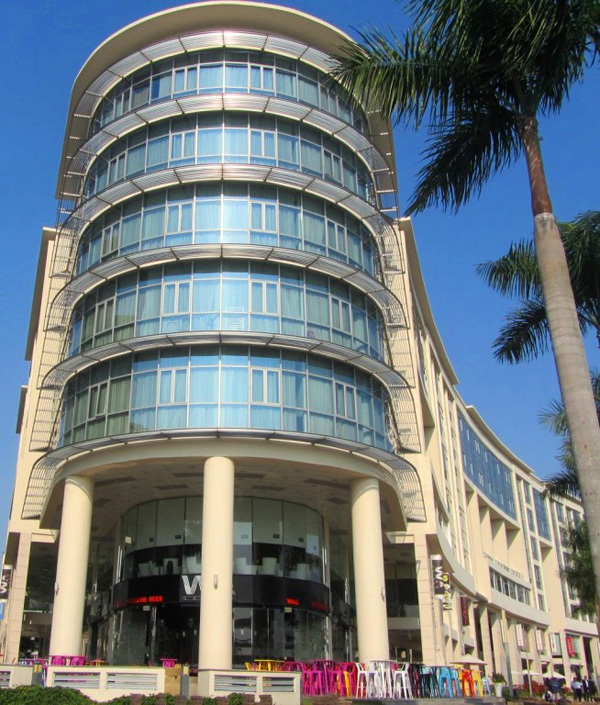 It’s been developed over the last few years into the perfect package of high-end residences, prime office space, public outdoor recreational areas, and a string of international dining and drinking chains with outside seating overlooking the water. It’s a quiet, clean, and slightly surreal space to unwind at the end of a busy day in Saigon. Why surreal? Well, because this is supposed to be Saigon; steamy, chaotic, noisy, and exotic. The Crescent is none of the above. The waterside architecture is all glass and curves, and there’s a definite impression that everything is orderly and under control. This is Saigon’s future; this is Singapore. And very nice it is too, even if it does lack a certain ‘Vietnamese-ness’. The Crescent Walk spans a couple of kilometres along Tôn Dật Tiên (Sun Yet Sen) Street, and is a particularly beautiful place to watch the sunset. A sleek and slender bridge connects The Crescent Walk with the green pastures of Hồ Bán Nguyệt Park – great for a weekend picnic. Botanical Gardens & Zoo, Saigon The only park in this list that requires a fee (50,000vnđ per adult), Saigon Botanical Gardens and Zoo is one of the oldest in the world. Opened in 1865 in the early years of the French colonial period, the gardens were created by Jean-Baptiste Louis-Pierre, who is also responsible for many of Saigon’s other green spaces. A dense enclave of vegetation along the banks of the Thị Nghè Channel, these sprawling tropical gardens are impressive in scale and variety. 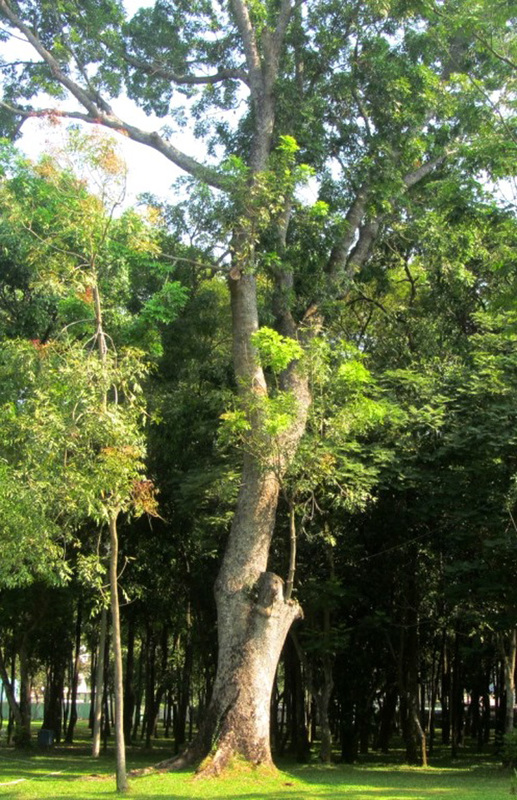 The giant trees, with gnarled trunks like elephants’ feet, are all labeled in Vietnamese and English. The air is scented with jasmine and other blossoms and natural perfumes. 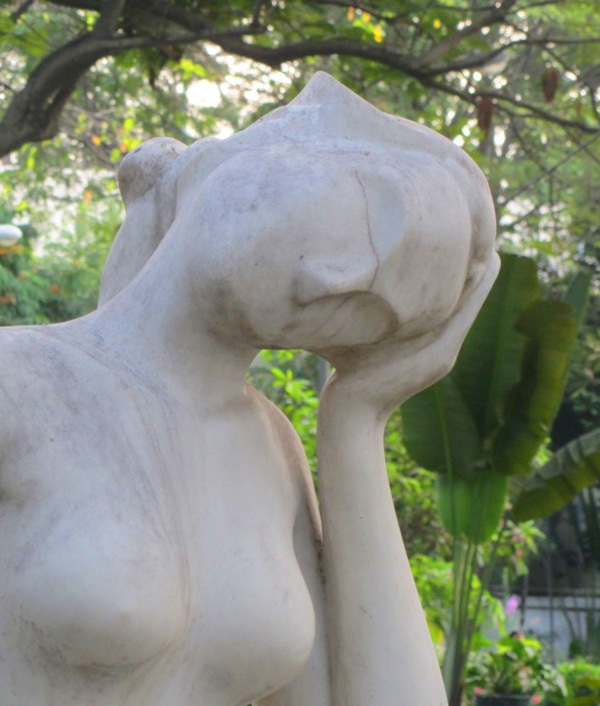 Louis-Pierre is commemorated by a sculpted bust at the gardens’ entrance. The shaded benches along the quiet, meandering pathways are a favourite spot for young lovers. However, there’s a fair amount of tat, including concrete fairytale castles, sorry-looking, miniature amusement park rides, plastic monkeys, and painted brick toadstools, all of which, I’m guessing, weren’t part of Monsieur Louis-Pierre’s original plan. The zoo receives a lot of negative press, but perhaps it’s not quite as bad as people make out. That’s not to say it isn’t bad – indeed, I’m not sure if a ‘good’ zoo exists, at least ethically. Elephants, giraffes, rhinoceros, tigers, primates, peacocks, porcupines – they’re all here, and you will actually see them. Conditions are cramped, run-down, and in need of maintenance, and animals look bored if not unhealthy. On weekends it belongs to the children, who love the open spaces and the animals. The Saigon Botanical Gardens and Zoo make for a relaxing stroll amongst nature and, even if the zoo is not a showcase for animals or zoo standards, at least it makes you think about the nature of zoos in general, and our place in the animal kingdom. 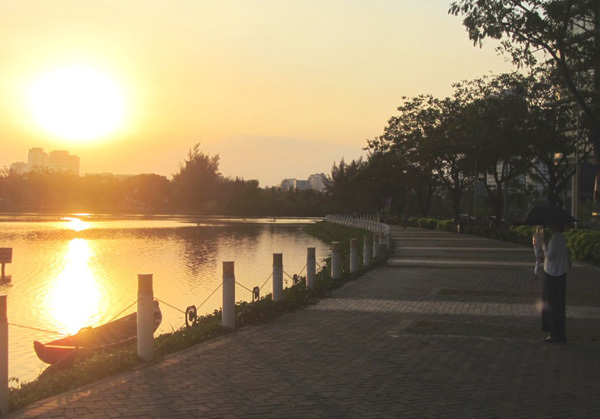 Van Thanh Park, SaigonSerene and peaceful, Văn Thánh Park nestles around a small lake, surrounded on all sides by high-end apartment blocks. Accessed via a diminutive entrance off the burgeoning, 14-lane Điện Biên Phủ expressway, Văn Thánh Park aims to recreate the aesthetic of an old, traditional Vietnamese village. Wooden trunk canoes lie beached on the grass, bamboo lanterns hang from the trees, feline stone statuettes guard crumbling red brick gateways, coconut palms line the lakeshore, areca palms line the pathways, tropical fruit trees dot the lawns, and bright bougainvillea, scented jasmine, heliconia, and cannonball flowers light up the gardens. 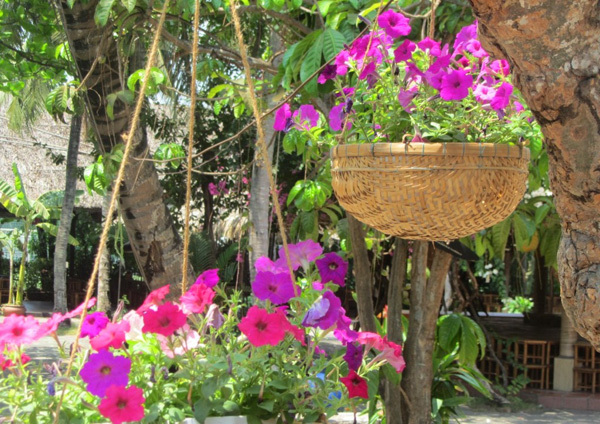 Discreet and tasteful, this is a great escape from the heat and chaos of weekday Saigon. There’s a good restaurant and a café by the lake which is a lovely place to bring a date. 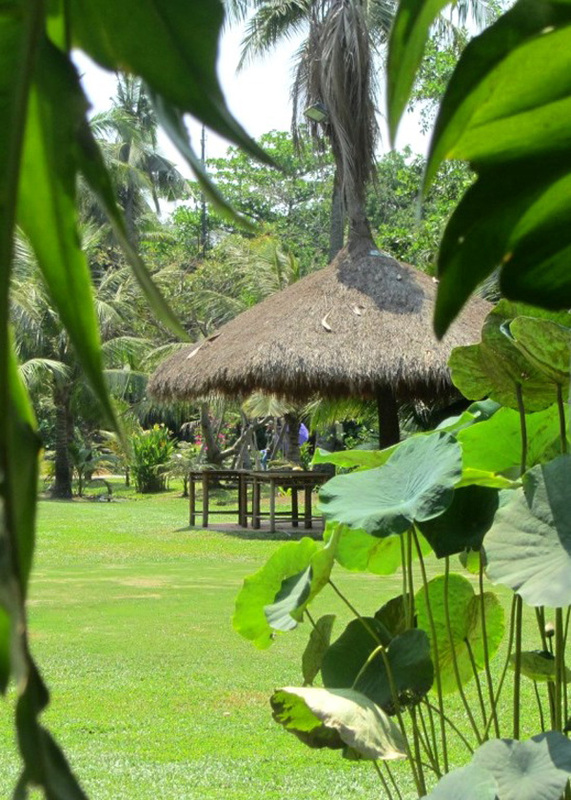 Gazebos on the grass can be hired for a picnic or barbecue with friends (around 400,000vnđ). Entrance to the park is free but you have to pay to use any of the excellent facilities here, such as the swimming pool and tennis courts. 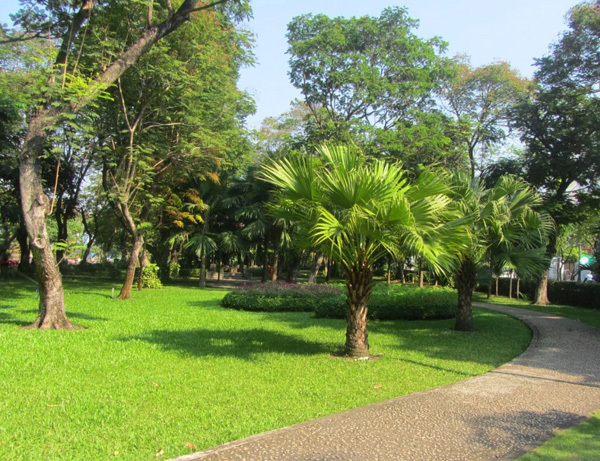 April 30th Park, SaigonSpanning either side of the grand boulevard that leads from the red bricks of Notre Dame Cathedral to the concrete smile of Reunification Palace, this park is right in the heart of old colonial Saigon. Named after the date of the liberation of Saigon in 1975, the park hosts grand celebrations when the anniversary comes around each year. 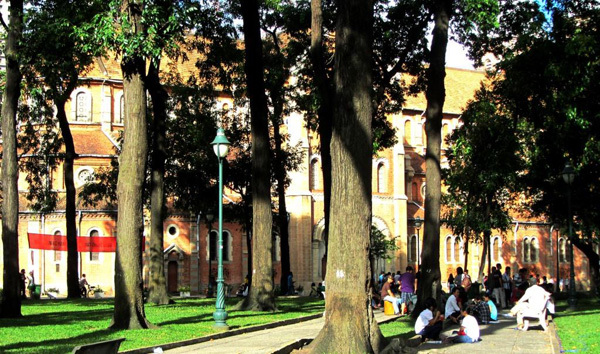 The tall trees, grass, and shaded walkways make for a relaxing stroll between two of Saigon’s architectural icons. 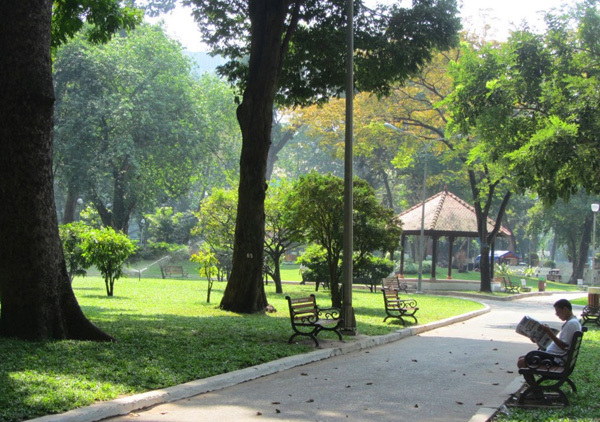 Quiet in the mornings, this park gets going in the late afternoons and evenings, when it plays host to a lovable Vietnamese youthful tradition: café bệt. Essentially drinking coffee and chatting with friends in the open air, café bệt draws hundreds of Vietnamese students, who gather at dusk to gossip, flirt, play guitar, sing, and relax in the cooler hours of the day. The park is lined with popular cafes and upmarket chains so you’re never far from a cappuccino. But there are also street vendors who cater to the café bệt crowd in the evenings, selling Vietnamese coffee in plastic cups and light snacks, such as crispy pancakes and kebabs. 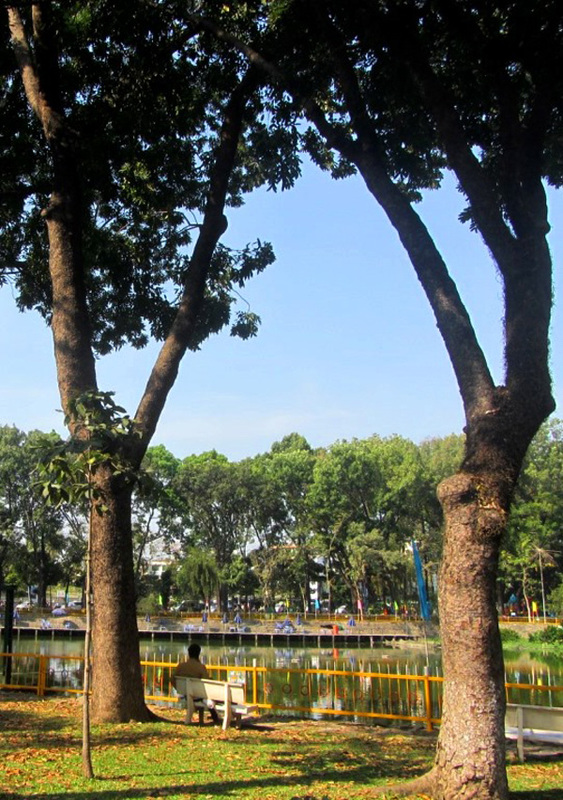 To best enjoy this park, grab a street snack and take a stroll around, watching Saigon’s youth unwind, and maybe joining them for a song on the guitar. Read more about café bệt HERE. 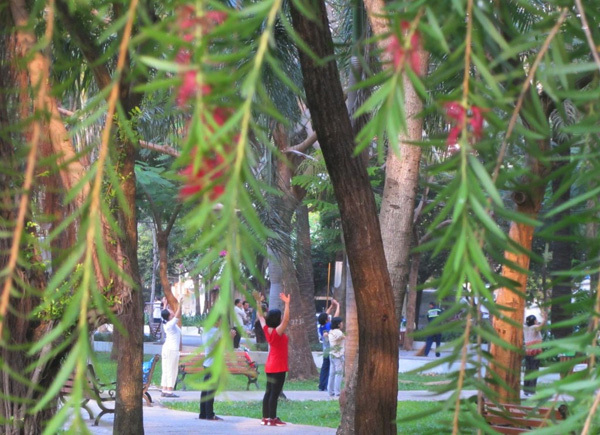 Le Van Tam Park, SaigonPeaceful in the mornings, but busy in the evenings with roller-skaters, roller-bladers, ballroom dancers, joggers and martial artists, Lê Văn Tám is a manicured park in a traffic-clogged part of the city. Low trees with twisting branches are arranged in neat rows with a wide pathway leading down the middle to a victorious, socialist-realist sculpture. A few creeping banyan trees add to the tropical atmosphere, and covered gazebos provide shelter during the rains. Hemmed in on all sides by some of the most congested, nightmarish streets in Saigon – Võ Thị Sáu, Hai Bà Trưng, and Điện Biên Phủ – the park’s peace is all the more apparent and welcoming. Indeed it has long been a place of peaceful rest: during French colonial times this was the site of Saigon’s elite cemetery. 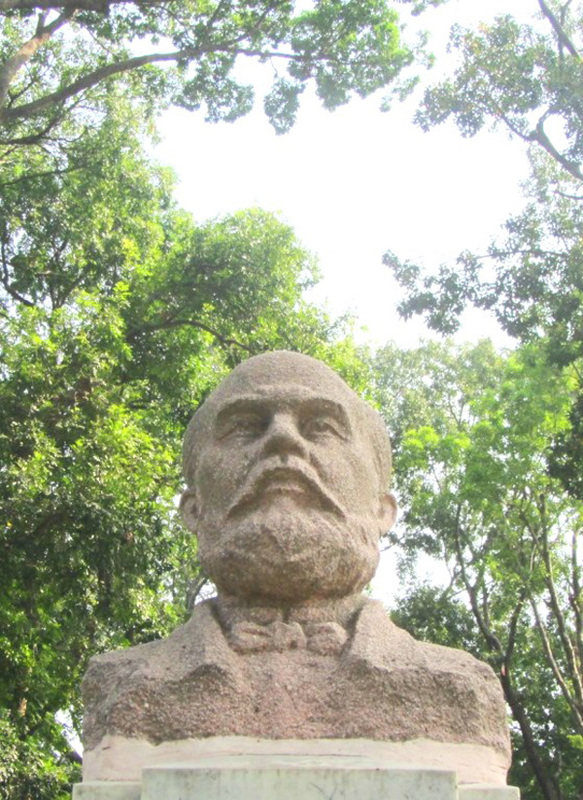 After the exhumation of its former ‘residents’, the cemetery was renamed Lê Văn Tám Park, after a Vietnamese revolutionary martyr from the First Indochina War. Today, some locals believe the park is haunted, but that doesn’t seem to stop most people from having a lot of fun here from dusk onwards. September 23rd Park, SaigonJust across from Saigon’s buzzing backpacker area, this park is long and narrow, reflecting the nature of its former incarnation as the final approach to what was once Saigon’s main train terminus. Alive with activity from the early hours of dawn, September 23rd Park got its name from a brief but brutal rebellion against the reinstatement of French control in Saigon, just three weeks after Ho Chi Minh had declared independence on September 2nd 1945. There’s a kinetic energy to this park: badminton, kung fu, aerobics, yoga, jogging, and đá cầu (like badminton, but played with feet rather than rackets) are all practiced here. Meanwhile, young couples, dressed for work, share a quiet moment on the benches under the low hanging branches of copperpod trees, before they must part and go their separate ways to work. There’s more concrete than grass, but there’s plenty of shade provided by dozens of palm and tamarind trees. Gia Dinh Park, SaigonCovering a massive area just southeast of Tân Sơn Nhất Airport, Gia Định Park is a big but bland green space. 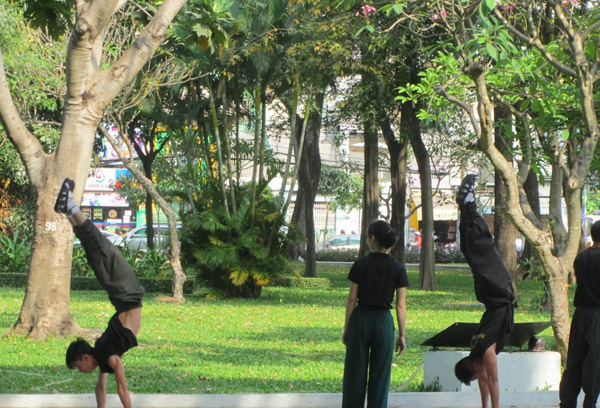 Splaying out on either side of Hoàng Minh Giám Street, the park’s regimented rows of tall trees – over 700 in total – stand like Doric columns supporting a roof of leaves. Even though a portion of this park has recently been bulldozed for a new airport road, there’s still a large area to explore. The colonnade of trees is great, but there’s plenty of wide, open spaces that are extremely exposed to the sun and heat during the daytime. In the early mornings and evenings, however, they are alive with sports and activities, attracting both young and old. Venture deeper into the park and you’ll find it gets more interesting. 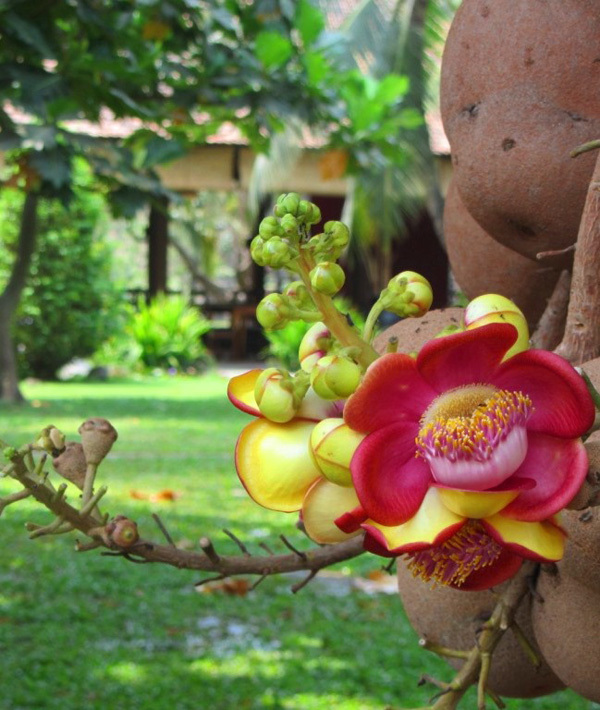 Winding pathways lined with bamboo lead through well-tended lawns, and frangipani trees fill the air with their bewitching scent. Once considered the perfect site for Saigon’s first golf course, in the 1950s, it’s now seen by many as the lungs of the city. 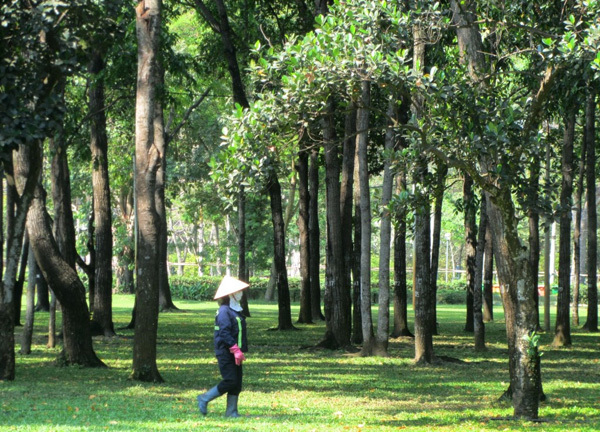 Gia Định Park is so big that the work force required for its upkeep is huge, and there’s always a team busily doing something – mowing lawns, pruning bushes, raking leaves, or cutting branches. Binh Quoi Parks, SaigonThese three ‘tourist parks’ are strung along Bình Qưới Street on Thanh Đa Island, in the Saigon River. Created by a canal, which cuts out an oxbow meander in the river’s course, Thanh Đa Island is located northeast of Saigon city centre. Bình Qưới Parks romantically recreate rural Vietnam, specifically Mekong Delta villages of days gone by. Lotus ponds, thatched huts, fish-pools with suspended nets, wooden canoes, bamboo water wheels, wooden carts, and abundant tropical foliage all aim to evoke an idyllic, pre-industrial Vietnam. It’s hot and steamy here beside the canal, but the parks’ open spaces and shaded areas make it a lush and easily accessible retreat from the city. There are good restaurants at all locations, specializing in delectable southern cuisine, such as the famous canh chua cá (sour soup with fish). Fishing is a popular activity here, and the pretty gardens make this one of the most sought after locations for wedding photos in Saigon: it’s quite a sight to see the bride and groom sweating away in their full wedding gear, posing under the midday sun. Of the three locations, Bình Qưới 1 is the best all-rounder (see pin on map), but 2 is good for the swimming pool, and 3 is good if you just want a drink and a meal by the river. All locations can get busy on weekends. 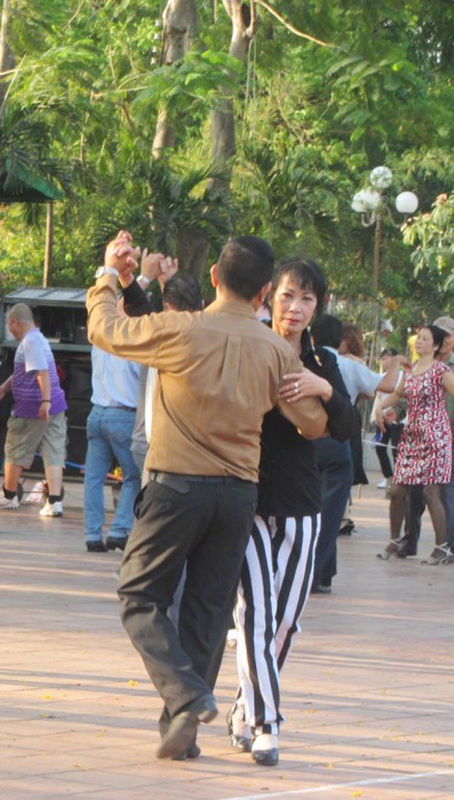 Le Thi Rieng Park, SaigonBusy – raucous, even – in the early mornings, Lê Thị Riêng Park is bursting with activity: ballroom dancing, military marching, competitive badminton, martial arts, and local school calisthenics routines. This park is an extremely well-used open space, so it’s not quite the serene getaway that other parks offer. There is a small body of water where people fish and boat, and couples cuddle by the shore, but the water is not especially clean. 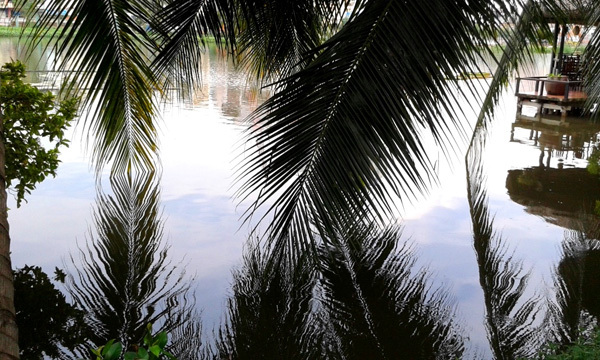 The park boasts a variety of foliage, including copperpod trees, eucalyptus, tamarind, and bottlebrush trees, whose stooping branches lean over the placid lake. As well as nature, there’s a fair amount of kitsch: crude statues of forest animals, storybook bridges and gazebos, strange sculptures of guitars and other seemingly random objects dot the park. Named after a female war hero from the struggle against French colonialism, a strong military theme runs throughout this park. An angular, relief-sculpture of Trần Phú, first general secretary of the Indochinese Communist Party, takes pride of place, in front of a shrine to martyrs who lost their lives during the wars of the 20th century. Hundreds of teenagers dressed in camouflage, presumably on some kind of military service, stand at attention listening to political and military doctrines, while others learn how to march in unison. Nighttime is just as busy as the mornings, when a night market opens around the park and students flock to the substantial amusement park here. Always busy, never tranquil, Lê Thị Riêng is a park of action not rest.